Geoffrey Canada, very charismatic, threw away his notes at the beginning of the talk. Notes may comfort the audience, but this speaker didn’t need them. His topic? “Changing Lives, Changing Communities.” It was my NYU college reunion on Saturday (25 years since undergrad, and 20 years since grad). I’m interested in what makes for community and how to uplift people caught in the multi-tentacled beast of poverty. Having written about reducing poverty through my work for Global Ministries, I like to learn what works, what doesn’t, and what the average person can do to help dig another person out of poverty. 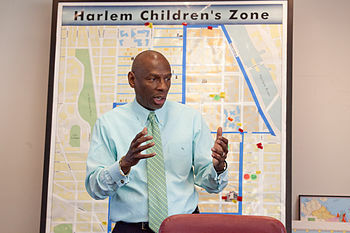 The Harlem Children’s Zone is digging deep to reduce entrenched poverty. a deadline for a writing project. < Previous You win some. You lose some.